I’m seeing new Galaxy S5 concepts and renders almost daily, so it’s hard to keep up with all of them. One thing is for sure, though. Designers have all switched to the new look suggested by those leaked Samsung patents from a week or two ago. Phoenix Pham has rendered this one here, this sketch, which may not be perfect, but it’s a nudge towards a new direction. That direction takes the Youm screen that goes to the side of the handset and applies it on both sides, from what I can see. 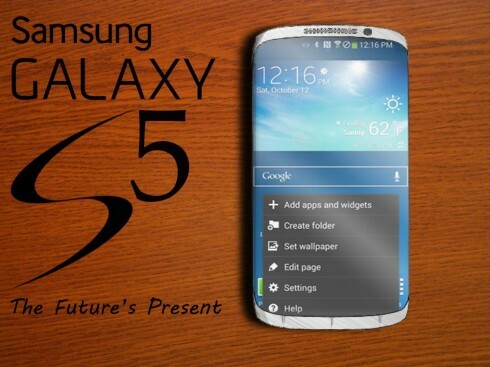 It may make the Galaxy S5 vulnerable to glass shattering, but it also looks hot. Notice the elegant slight curve at the top and bottom and lack of Home button. There’s still room for buttons at the bottom, but I guess sensors would be more welcome in that area. The TouchWiz UI feels pretty much the same applied on top of KitKat, so no big changes here! I’m guessing this phone would fit in hand perfectly!